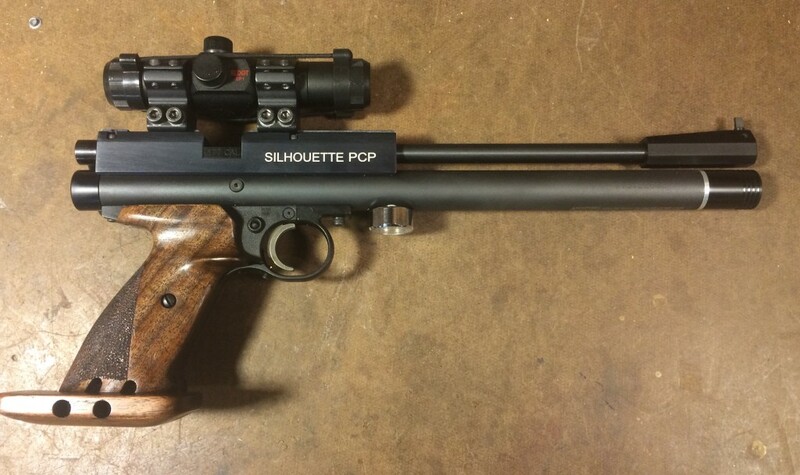 In my previous post, I described my initial impression of the Crosman 1701p. 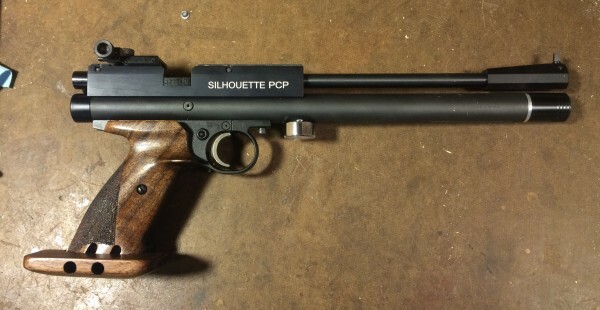 It’s a potentially very accurate pistol, but I thought it was held back from achieving its potential by a so-so trigger and simple grips. There wasn’t much I could do about the trigger, but there are a lot of aftermarket grips available. I ordered a set of Steve Corcoran’s adjustable match grips from Woods and Waters. Steve’s grips are a classic adjustable Bullseye design, with an adjustable palm rest, thumb rest, and carefully checkered surfaces to improve grip. It’s ergonomically shaped and fit my hand fairly well. I suppose I could improve the grip even more with some shaping. Scores went up with this combination, too. 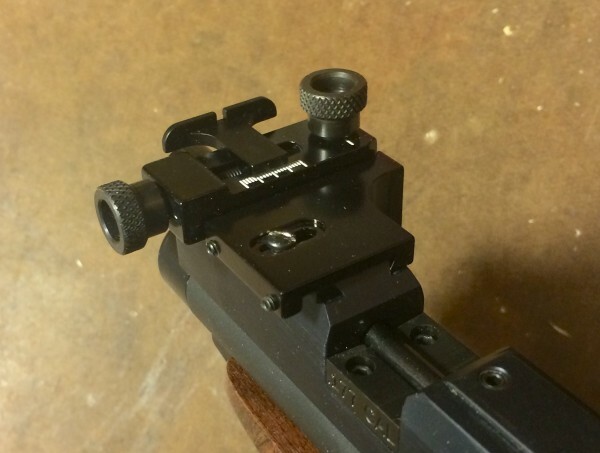 That leaves only the trigger and the firing mechanism. 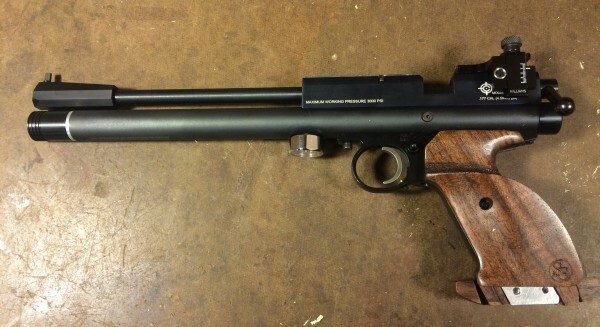 Like most PCP guns, the 1701p uses a firing system in which a spring loaded bolt is used to open a valve and dump a measured amount of high pressure air into the chamber. Unlike most match pistols, the bolt and spring in the 1701p produce a significant amount of recoil that tends to throw the gun off target. This isn’t a significant problem in Silhouette competition, where pistols are held with two hand, or braced against a leg, but in Bullseye style shooting it’s a significant factor. I think the 1701p does have potential as a budget match pistol, but it will require some more adjustment to the firing mechanism- and maybe even a lighter bolt. Despite an excellent barrel and good potential accuracy, the 1701p is undone by a trigger that’s not much better than the one found on the Daisy 717. I sold the gun, grips, and sight separately and went looking for another project. This was written by mje. Posted on Wednesday, January 27, 2016, at 4:24 pm. Filed under General, Tests and Reviews, Tuning. Bookmark the permalink. Follow comments here with the RSS feed. Both comments and trackbacks are currently closed.